While nurturing babies is an essential practice that is as old as humanity is, there are admittedly many advantages to raising a baby in this modern age. Modern parents swear by the best bassinet, the best high end diaper bags, and even the best pacifier, which is among the reasons why today’s market is saturated with these products making it challenging to choose what to purchase for the little ones. If you’re at that stage where your pre-parental anxiety is only being compounded by the lack of answers that Google is providing you regarding what items you truly need and which are the best among those, then we got you covered–at least with the best high end diaper bags. What makes a high-end bag one of the best? We’ve compiled this list to help you answer that question. 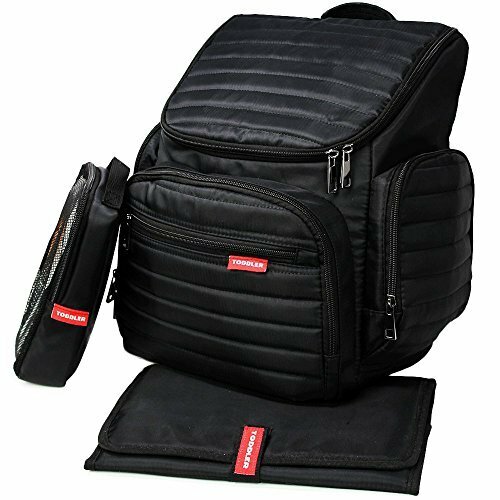 The Toddler One Quilted Diaper Backpack is a sizeable bag that aims for maximum functionality with its great capacity for storage. This roomy backpack is specifically designed to hold all that moms or dads need during an outing with their babies such as wipes and baby feeding bottles. Plus, there are small pockets inside the backpack to help you organize things like your phone and keys! On top of its great functionality, this backpack also has the Bas Bleu backpack design which looks great. The Toddler One Quilted Diaper Backpack features a sleek design with forwarding pockets. Not only does it have space to accommodate everything you need and a sleek and attractive design. This backpack is also very comfortable! Weighing in at just two pounds and measuring 17 x 7 x 14 inches, you don’t have to worry about carrying it around even for long periods. It was designed to make sure you don’t have back pains. Don’t worry about losing that pacifier in some unreachable corners of the bag. The Toddler One backpack comes with pockets in different sizes including an insulated pocket, and a wipes pocket with a window for easy access! The black material helps hide the inevitable stains. The insulated side pouch doesn’t fit all sippy cups or bottles, and you may have trouble fitting your baby’s into it. 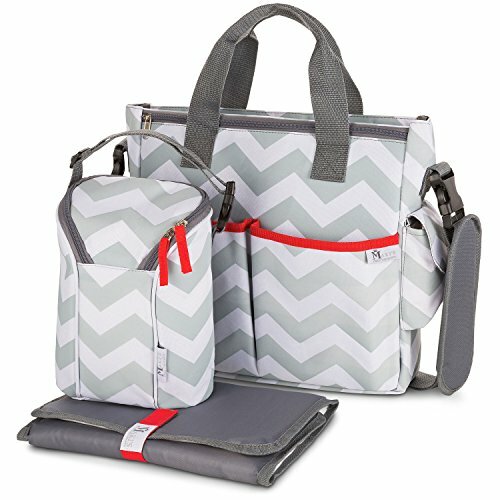 Maki’s Connecting Hearts Baby Diaper Bag for Girls and Boys comes in stylishly chevron gray with white and red prints. The diaper bag design gives it a cute weekender tote bag feel, so you don’t have to sacrifice style for convenience. The diaper bag can also be comfortably toted around thanks to its padded shoulder straps, and it can easily be slung onto the back of a stroller with its fashionable stroller straps. 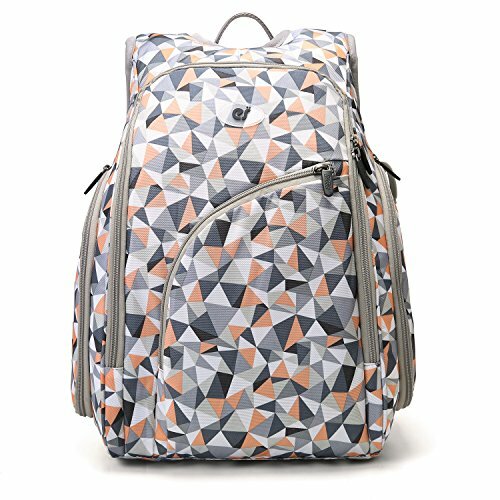 This Baby Diaper Bag for Girls and Boys is compact at 12.6 x 14 inches but manages to be practical as well as offer you with all the storage space you could need. It comes with twelve easily accessible pockets and one main compartment that helps you organize all your necessities and keep them within arms reach. This lovely tote includes a portable changing pad, a multipurpose bottle bag, and an adjustable carry handle to keep your baby’s bottles and sippy cups. You can also use it to store that extra cup of coffee you’ve been reverently clinging to all morning, and it will keep it warm for you! Comfortable, even as a shoulder bag! Although compact and functional, the size may not be suitable for long trips. The ECOSUSI diaper backpack features a functional design with special back pockets for easy access to essentials like your wallet or phone, a front panel that opens completely so that you can see everything you have inside the bag, as well as a cushioned changing pad. Comes with a sleek but cute design along with all that functionality it has. It is designed to help you out on the move and comes with a pair of detachable hooks for easy hanging and hands-free, on-the-go convenience. The front panel that opens completely for easy access. Enough pockets, and at sizes that actually make sense! The bottle holder is not contoured for a bottle, so you may struggle a bit with storing one in there. The Toddler One Quilted Diaper Bag by My Toddler, Maki’s Connecting Hearts Baby Diaper Bag for Girls and Boys, and ECOSUSI Diaper Backpack are all designed with the comfort of both the parent and baby in mind. These high-end bags all aim to bring both style and functionality with the number and kinds of pockets to other essentials such as changing pads and easy-access compartments. The ECOSUSI Diaper Backpack has the benefits of both the Toddler One Quilted Diaper Bag by My Toddler and the Maki’s Connecting Hearts Baby Diaper Bag for Girls and Boys: style and versatility, but with also enough storage space that you won’t have to stress about how much you need to pack. The fully opening front panel and back pockets make this bag useful especially for the parents on the go who don’t have the time to organize the bag and rummage through the pockets every time they need to be somewhere and no choice but to tag the little ones along. Diaper bags, as well as other baby goods at this day and age, were created to help parents in raising their wee ones at the same time enabling them to do other things that adults have to do. Often, it may seem like the advancement in baby rearing research and technology comes as heaven-sent. However, like any other innovations, it is best to keep in mind that it also comes with problems and not just solutions. The important thing is that you take a look at what these products can offer at the same time weighing the disadvantages. If the pros exceed the cons and it pretty much satisfies your needs and ensures your baby’s safety, then give it a try. After all, taking care of your baby is such a big responsibility and one heck of a job, you’ll definitely need all the help you can get.